10 mm Weird WWII WIP Pendraken's "Mecha"
Pendraken's sci-fi range has Marines in battle armour which I'm using as Uber Soldaten, but it also has a walker (SF9) that I painted as a mecha for my Weird WWII project. I have only added a machine gun that can be seen next to the green windows. 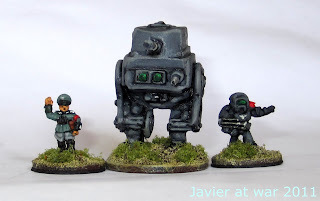 El rango de ci-fi de Pendraken tiene unos marines en armadura pesada que estoy usando como super soldados, pero también tiene un walker (SF9) que he pintado como un mech para mi proyecto de Segunda Guerra Mundial Alternativa. El modelo es tal cual se ve, tan sólo le he añadido una ametralladora junto a las ventanas verdes. When I was looking for some decals for my panzer mech I found some very old Tamiya 1/35 decals for German helmets and I decided to use them as shoulder pads for my Uber Soldaten. I think they turned out pretty neat. Cuando estaba buscando calcas para el panzer mech descubrí unas calcas de Tamiya 1/35 de cascos alemanes y las usé como hombreras de los super soldados. Creo que han quedado bastante bien. More to come: Allied in Powered Armour, German zombies, Red Skull, etc. Cosas por hacer: Aliados en armadura pesada, zombies alemanes, cráneo rojo, etc. I decided to expand Wolfenstein to Weird WWII and here there are some good guys and some Uber Soldaten that can either be used as heavy stormtroopers in Weird WWII or as bosses in Wolfenstein. Me he decidido a expandir Wolfenstein para usarlo en Segunda Guerra Mundial alternativa y aquí tienen a algunos de los buenos y también unos super soldados que pueden usarse como tropas de asalto pesadas o como los jefes de Wolfenstein. All the miniatures are from Pendraken. Pictures are clickable. Todas las minis son de Pendraken. Pinchando en las fotos se agrandan. Three Uber Soldaten with heavy assault rifle STG46, one sergeant and one specialist with heavy AT rifle. Tres super soldados con rifles pesados de asalto STG46, un sargento y un especialista con un rifle AT pesado. A size comparative picture of one Uber Soldat vs. one British Commando. Una foto comparativa de un super soldado y un comando británico. Return to Wolfenstein WIP. (edited). 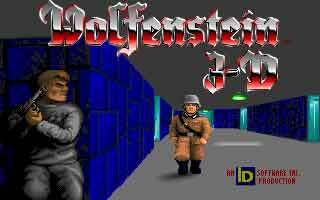 Do you remember that great PC game called Wolfenstein 3D? It was one of my favourite games. 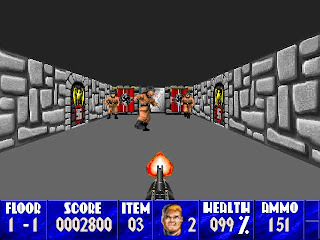 Se acuerdan de ese gran juego que se llamaba Wolfenstein 3D. Fue uno de mis juegos favoritos durante mucho tiempo. Pendraken's 10 mm dungeon is meant for Fantasy settings but when I painted it in grey it reminded me the walls of the first Wolfenstein. Here there are the first Nazi Germans and soon will follow powered armour troops, mechs, zombies and of course the good guys! 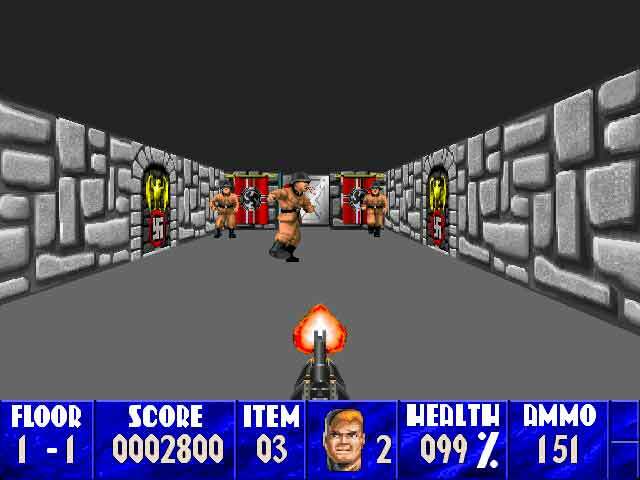 El dungeon de Pendraken en 10 mm está pensado para Fantasy pero cuando lo pinté de gris me recordó a aquel maravilloso juego para PC que era la primera versión de Wolfenstein. 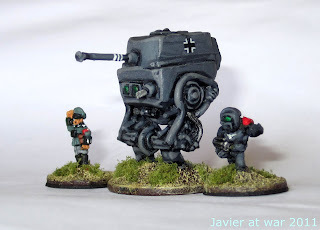 Aquí están los primeros Nazis y pronto seguirán tropas acorazadas, mechas, zombis ¡y por supuesto los buenos! The guard dogs are wolves from Warmaster. They are a bit big sized but they will do. Los perros guardianes son los lobos de Warmaster. Son un poco grandes pero servirán. A close up of the bad guys. Un plano corto de los malos. 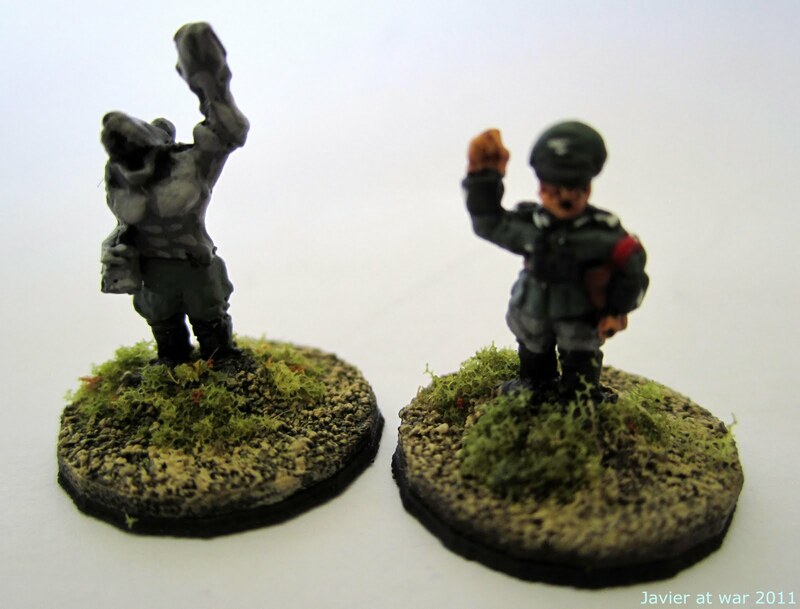 The converted werewolf is unfinished but here we can see it learning to salute properly, although the stupid beast is still rising the wrong paw! La conversión de hombre lobo está sin acabar pero aquí lo podemos ver aprendiendo a saludar correctamente, aunque la estúpida bestia todavía sigue levantando la pata equivocada. BTW, can anyone tell me how to make 10 mm petrol barrels or where to buy them? TIA. Por cierto, ¿alguien puede decirme cómo hacer o dónde comprar bidones de gasolina en 10 mm? 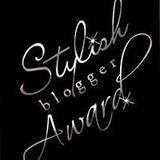 I have just been nominated for the Stylish Blogger Award by Ruarigh and I am pleasantly surprised as I never imagined being nominated for any award. I am very happy of having started this blog a couple of years ago because it has allowed me to share my hobby and to know a lot of interesting people from all around the world. 1. Thank and link back to the person giving you the award. Ruarigh of The Ooh Shiny Complex and Heitaroi . Thank you for thinking about my blog for this award. One day I started to play all kind of board games, Role and strategic games with miniatures as well as computer games and I haven't stopped since then. I live in Canary Islands and I went surfing for many years. I have being reading and collecting comics for years. I love reading Fantasy, Sci-fi and "historic" novels like Bernard Cornwell's. I like dogs but I do not have any. I definitely quit smoking after 22 years! 3. Select 10-15 blogs who you think deserve this award. Heitaroi Wargames is a Spaniard mate like me and his blog is full of wonderful projects that he shows step by step, like his gladiator's schola and gladiators. He writes in Spanish and in English. Ruarigh at The Ooh Shiny Complex who has many points in common with me in the hobby and not only the Warrior Heroes: Armies and Adventurers games. Ruarigh again with his other blog Talomir Tales where he is narrating the funny adventures of brother Cedric in the world of Talomir, using the rules Warrior Heroes. 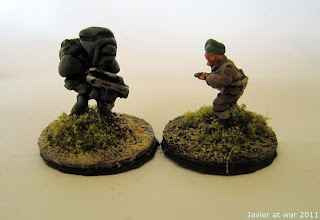 Dropship Horizon as an excellent source of information of 15 mm. sci-fi gaming and miniatures. The Historical Miniaturist. A bit of everything, especially of THW games. 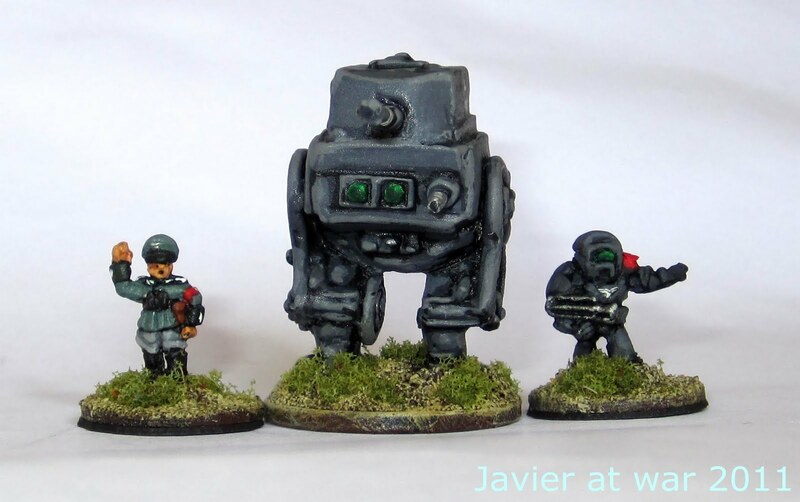 Chroniques du Fort Bastiani is a French and English language blog with excellent sci-fi BATREPs and very well painted minis. 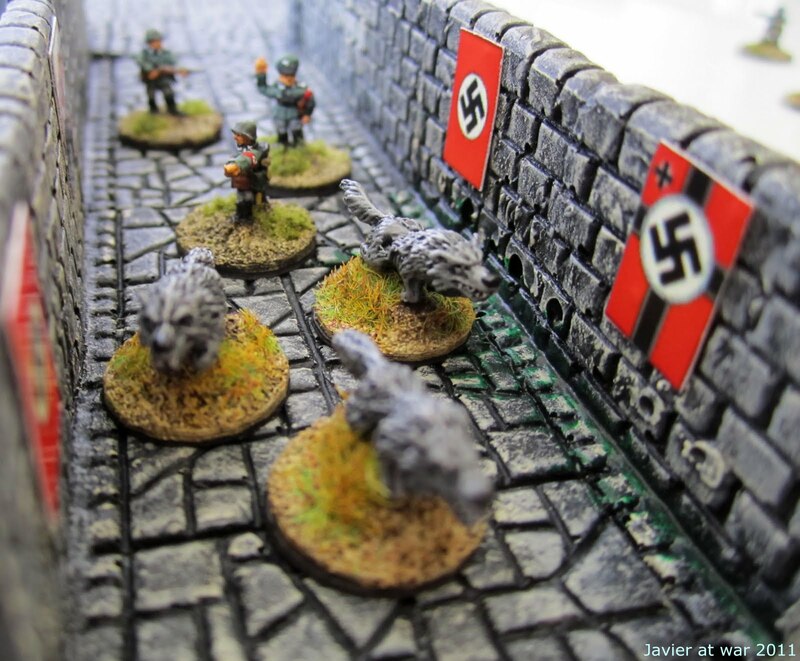 Geektactica shows awesome painted Impetus armies and BATREPS as well. Mik's minis. He publishes faster than I can read! Iron Mitten for his absolutely lovely cartoons. Doctor Mercury's Lab. All Iron Ivan games with lots of great BATREPS. 4. Contact these bloggers and let them know about the award.